Most cases of endometriosis involve the pelvic area, according to A. M. Wolthuis, C. Aelvoet, J. Bosteels and J. P. Vanrijkel in a 2003 article in the journal "Acta chir belg." However, the condition can occur in other parts of the body as well, with symptoms that intensify with the menstrual cycle. Endometriosis tissue attached to the diaphragm--the large muscle involved in breathing--may require surgical treatment to relieve the symptoms of pain. The symptoms of diaphragmatic endometriosis all involve pain in the area around the chest or abdomen. One common symptom of diaphragmatic endometriosis is chronic right shoulder pain, according to Christopher Sutton in the 2006 book "Modern Management of Endometriosis." 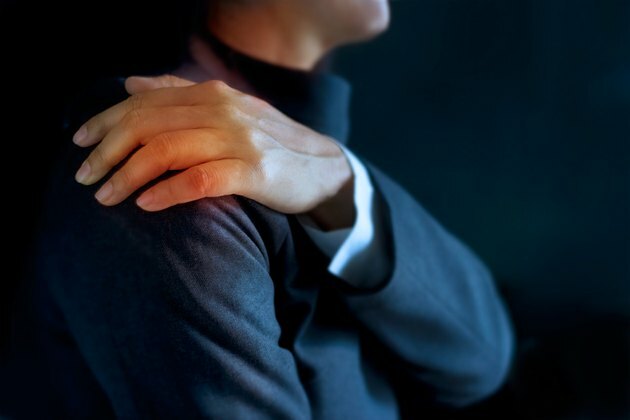 For patients with this condition, the shoulder pain gradually increases and coincides with the menstrual period, according to David B. Redwine, M.D., on the Endometriosis Treatment Program website. However, over time, many patients began to feel constant low-grade pain throughout the month. Some patients with diaphragmatic endometriosis also develop radiating chest pain, often on the right side, according to Dr. Redwine. This pain may also resemble pain that people may feel during physical activity, so endometriosis may not be suspected as a cause at first, according to the Trying to Conceive website. Diaphragmatic endometriosis can also cause upper abdominal pain, according to Camran Nezhat in the 2000 book "Operative Gynecologic Laparoscopy: Principles and Techniques." The diaphragm separates the chest from the abdomen, so pain from the diaphragm may be felt in the upper belly. For some patients, diaphragmatic endometriosis can cause pain when reclining, according to Dr. Redwine. The pain while lying down can make it difficult to sleep; the patient may have to sleep sitting up to relieve the discomfort. Other patients may have to find a position that is more comfortable in order to get any rest. In some instances, the endometriosis lodges in the chest cavity on the diaphragm. For these women, coughing up blood or bloody sputum may be another symptom of diaphragmatic endometriosis, according to the Endometriosis Research Center & Women's Hospital, Inc.